Every time you flip on a light switch, coal is likely burned to heat up steam to turn a turbine, creating electricity that powers that light bulb. Because of Climate Change, pollution, finite resources, and eventually cost, there is a movement towards trying to find more clean and renewable power sources and more efficient ways of dealing with them. This link is all about those technologies. The best option for clean, renewable power is currently Wind Energy. 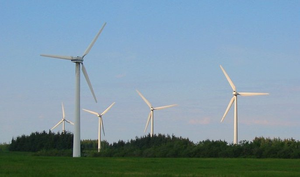 Wind energy involves setting up turbines that capture some of the energy moving through the air. These turbines can be setup in open spaces on land or out at sea. Wind power is currently approximately cost competitive with coal and is growing as fast as people will allow it. Another great option for clean, renewable power is Solar Energy. Solar energy involves capturing energy from the sun in one of a few different ways. The first option is by creating electricity from those blue photovoltaic panels most people are familiar with. A second options uses a similar idea, creating electricity with thin flexible materials called Thin Film Photovoltaic panels that can coat things like roofing materials. These are less expensive, but also less efficient. A large scale solution for solar, besides putting a lot of photovoltaic panels in a field, is something called Concentrated Solar Power (CSP) and relies on capturing the sun's heat to make steam and generate power like a coal plant would, by spinning a turbine. And finally, there is residential solar thermal power, where you collect the sun's heat to heat your hot water and potentially also your home. This is the best solar technology out there today and there is no reason to not have it on most homes and businesses. There are a number of other technologies that are being proposed that are either not as clean, not as widespread, or not ready to debut yet. We include them though because there will not be only 1 or 2 energy sources in the future, wind and solar will need some help. Nuclear energy gets its own section because, while controversial, it is in fact cleaner than coal, already makes up a decent amount of our energy portfolio, and is likely the best candidate to support wind and solar energy. The others are included in the Emerging Technologies section, which goes through each other major suggestion for clean power and talks about why they are not clean enough yet or not able to be used in enough parts of the world. The other two sections of this link cover Smart Grids and Storage. Both of these are not ways of making energy, but better ways of handling the energy that we do make. Smart grids allow utility companies to better understand the energy being produced and consumed at any time. They do better at handling things such as wind and solar that have variable amounts of energy production over time and they can work to alter demand and also make customers make better, more informed decisions about their energy usage. Large scale energy storage is more or less what it sounds like. It involves taking energy that is produced and holding on to it until there is a demand for it. Demand changes over the course of the day, and so when demand is low, we have to turn off some power plants or have them produce less energy (which is often less efficient than producing as much as it can). And then, when energy demand increases, we need to turn on lots of extra, inefficient power plants to meet that demand. Storage would even this out and let us run fewer plants all the time at their most efficient states.